For nearly 60 years, the University of Minnesota has been presenting a summer melodrama on a docked showboat on the Mississippi River, currently across from downtown St. Paul. The Minnesota Centennial Showboat was christened in 1958, as those who know their Minnesota history could guess ("in 1858 Minnesota became a state"). 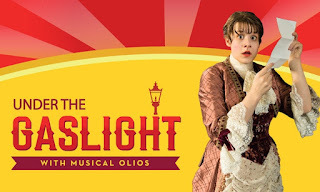 The first show was Under the Gaslight, which returns this summer for their last season at the Showboat (click here for more on the history of the Showboat). While this is only the second U of M show I've seen at the Showboat, I'm sad that it was my last. The creative team includes some of the top talent in town (including director John Miller-Stephany, musical director Andrew Cooke, choreographer Linda Talcott Lee, and costume and scenic designer Mathew J. LeFebvre), and the cast is chock-full of talented young people that are the future of theater in this town. The melodrama is a fun, entertaining, and little-seen genre that encourages the audience to "vocalize appropriately." The Showboat is a unique and charming venue, and I hope that someone puts it to good use (and will someone please do Show Boat on the Showboat already?!). Whether you've seen dozens of Showboat melodramas, or none, it would behoove you to board the Showboat one last time for this uniquely pleasing theatrical experience. 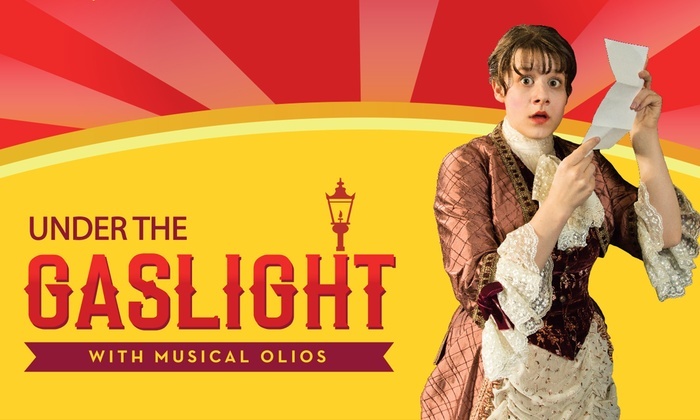 Written in 1867, Under the Gaslight takes place in post-Civil War high society of NYC. Two cousins, Pearl (Mackenzie Shaw) and Laura Courtland (Olivia Wilusz), are in mourning for their mother/aunt. Pearl is ready to break out of the rules of mourning and join society again, while the more serious Laura, engaged to the dashing Ray Trafford (Ryan Dean Maltz), is content to stay at home. Their life of parties and sleigh rides is interrupted by a mysterious man named Byke (Corey Quinn Farrell) who threatens their place in society with a secret involving Laura's true identity. A disappearance, a broken engagement, blackmail, kidnapping, an attempted drowning, and perhaps the biggest staple of the melodrama - someone being tied to train tracks - all occur before we get to our happy ending where the villains are punished and the heroes live happily ever after. Interspersed with scenes of the play are charming olios, or musical interludes. These songs have nothing to do with the plot, but are performed in the style and period (thereabouts) of the play. Songs like "I'm in the Market for You" and "A Girl for Each Month of the Year," performed by various (or all) members of the 12-person ensemble (and accompanist Jill Schendel, who also provides the soundtrack throughout the play), complete with extravagant costumes. One of the fun things about the show is that everyone in the cast has their moment on stage, and they all step up to the challenge. Rarely have I seen 12 such talented, charismatic, and enthusiastic young people on stage, and I look forward to seeing them on stages around town in the coming years. The tiny showboat stage provides the setting for many different locations, typically with just a two-dimensional painted backdrop to set the scene, but sometimes with complicated set pieces involving a pier or the aforementioned train tracks. The backdrops have a charming old-fashioned feel that perfectly match the tone of the show. 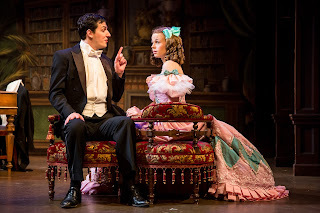 Under the Gaslight continues at the Minnesota Centennial Showboat through August 27, when the curtain will fall on the U of M summer melodrama for the last time, marking the end of an era. There will no doubt be other activities on the Showboat, and opportunities for U of M theater students to share their talents, but it won't look like this.